First Newark, then Clacton and now Rochester & Strood. Next week, The Conservative Party are battling against UKIP in a by-election for the third time in six months. Whilst every by-election has its own local and contextual factors both parties will now be very aware of the other’s strategy and tactics; the lessons learnt from these electoral skirmishes will undoubtedly be taken into the final battle that concludes on 7th May 2015. 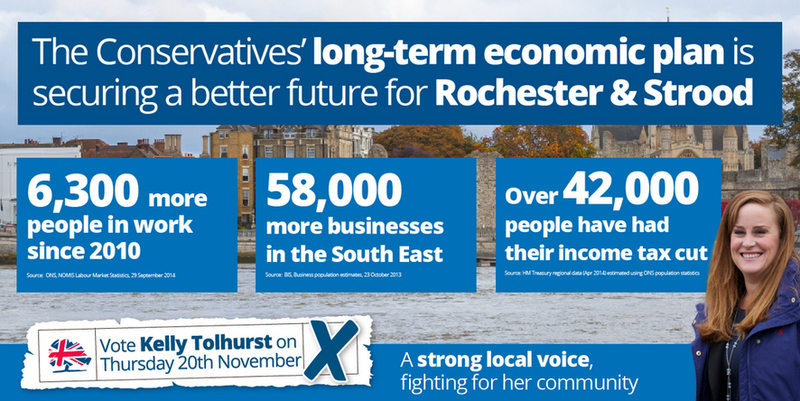 It is for that reason that the above graphic being distributed in Rochester & Strood is interesting. It is the distillation of 6 months’ worth of brutal by-election campaign communications. Therefore, I expect that the three messages contained in the advert are very likely to be the key facets of the Conservative Party’s pitch for re-election: more jobs, economic growth and tax cuts. There has been plenty of commentary on how the Conservative Party should deal with the threat provided by UKIP (and to a lesser extent Labour) and it seems that the Tory’s are – sensibly – going to stick with the same formula that has seen governments that go to the polls in times of growth returned time and time again: remind voters that the government are more economically competent than the Opposition and give voters reasons as to why they should be optimistic about their financial future if the status quo remains. Yes, the Conservatives will almost certainly lose the Rochester & Strood by-election to UKIP, but today more than most days the Conservative Party should have confidence in this strategy for the general election battle. The Office for National Statistics announced this morning that wages are now rising at a stronger pace than inflation for the first time since 2009. Not only will this ease the squeeze on household budgets, it will simultaneously remove credibility from the ‘cost of living crisis’ plank in the Labour Party’s general election campaign platform. Britain’s recent electoral past demonstrates that if the public is optimistic about the economy and a government has a reputation for economic competence, the Opposition Party is incredibly unlikely to end up in 10 Downing St. If the economy remains strong and the Tory’s stick with the strategy implied in the image above, history dictates that Conservative Party should emerge with the most parliamentary seats. The strategy sounds simple enough and given that it is one that has been successful so many times in so many countries, one might think that the Conservative Party should have no problem with sticking with it. But political parties consistently allow themselves to be blown off course by relatively minor events (such as losing by-elections to minority parties in their supposed electoral strongholds).